Steve McDonald: Our guest this week is the Matthew Carr of Prime System Trader and the single most successful analyst at The Oxford Club. Matthew, you hold the all-time record for high returns at The Oxford Club? Matthew Carr: I do, 2,733%. SM: My God. OK, 2,700%. Matthew's here to talk about something called visual cue stock analysis, and I'm going to let him explain to you what it is. Matthew, what are visual cues in stock analysis? How do you use them? MC: Well, the first place I would start looking is at the share price of a company. Right off the bat, that gives you a lot of information because if you see the share price moving up from the left side of the screen to the right, you have a company that has a lot of momentum in its shares. Everything is driving it higher. If it's the opposite - if shares are falling - then you potentially have a value stock. You try not to catch a falling knife, but you also have a stock that's suffering. 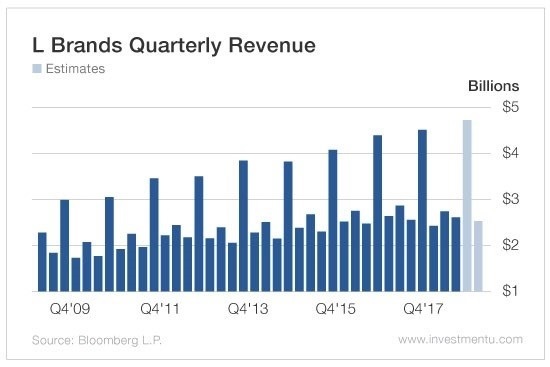 For me, one of the most important things I look at - that I think all investors should look at - is quarterly revenue for a company. That will tell you 90% of what you need to know about a company and its business - whether revenue is inclining so that you're seeing it go up quarter after quarter, whether it's on a decline, which means the company is in a lot of trouble, or whether you have what I call a sawtooth pattern, where there's an uneven nature to it. A lot of my systems focus on that sawtooth pattern because that's where we can find a lot of lower-priced stocks that are about to see their revenue spike. And we've done it in the past by looking at the company L Brands (NYSE: LB). L Brands is the maker of Victoria's Secret as well as Bath & Body Works. What you'll see is that throughout the year, during the first, second and third quarters, there's not much going on. But you see this huge, massive spike in the fourth quarter. That's where a lot of its revenue for the year is going to come from. What happens is share price follows revenue. So during those middle parts of the year where revenue is sort of flat or not doing much, shares of L Brands have a tendency to tumble. We bought in right before that, held it all the way through that fourth-quarter report, shares spiked and we ended up closing a 1,034% gain on L Brands calls a couple of years ago, just following this pattern. Like I said, 90% of what you need to know about a company comes from its quarterly revenue. The other 10% is just whether it's overvalued or undervalued. SM: OK, let's put a chart up on the screen now so that everybody can see what you're talking about - the visual cues from the share price and revenue. Go ahead and put one up there. MC: OK. And what you can see here is that fourth-quarter spike. Investors aren't that complicated, right? A lot of the time, a company says, "Alright, well I made $200 million this quarter. Next quarter, I'm going to make $210 million." That's 5% growth. But if you hear, "I made $210 million this quarter, and we're going to make $700 million next quarter"... Even if, year-over-year, that next quarter's growth is not super massive, for a lot of investors, that's a big pop. And all of a sudden everyone starts plowing in - share prices start moving higher. SM: How do our Members get into the visual aspect of analysis versus the hard data, the number crunching? Is there any way they can start to get a better understanding of this? MC: The first thing I always suggest is looking at quarterly revenue. Like I said - to me - that is the No. 1 place to start. You can get that through your broker, or you can also use whatever program you use to look at share prices. That will tell you whether you have a company that has momentum - if share prices are moving up higher over the last several months - or whether you have something that's in a bearish pattern where share prices are starting to fall. SM: How far back do you go on quarterly revenue when you're looking at it? MC: I usually go back 20 quarters, or about five years. MC: And then I look two quarters forward to make sure that pattern is intact. I always want to see - as much as I possibly can from quarter to quarter - what a business's revenue is and how a business is actually doing. SM: So basically, you're looking for repeating patterns. MC: I'm looking for repeating patterns. I'm looking for something predictable, something that I can understand and relate to. A lot of companies like L Brands - which does have that sawtooth pattern in its revenue - will talk about it in their revenue charts. And you'll hear that from a company like Nutrisystem (Nasdaq: NTRI). It'll talk about diet season in the United States, which follows the holidays. SM: I love that. Everybody overeats on the holidays. SM: Perfect. Thank you so much for taking the time to be with us. MC: Thank you for having me, Steve.